Old Town is the urban core of Lewisville. With structures dating back to the 1880s, Old Town Lewisville is a shopping and dining district with charm and vitality. Old Town’s beautiful historic buildings show off its architecturally rich heritage, while its historic home district is perfect for a stroll. Old Town boasts a public performing arts center and a number of shopping, dining, and plaza options. The entertainment district in Old Town is host to concerts, public art events, festivals, and more. The Tax Increment Reinvestment Zone (TIRZ) District in Old Town helps provide funding for infrastructure and future public investment. This special district helped fund the MCL Grand and City Hall. The City of Lewisville strives to maintain a unique character in Old Town, paving the way for investment. Old Town is a treasured part of both Lewisville’s past and its future. Become part of the story! For many years, the City has demonstrated its strong commitment to the success of the district through investing in planning, public improvements and incentives. Special procedures and inducements for building in Old Town apply. We encourage you to visit the Incentives section of our site for more information and to Apply Online. 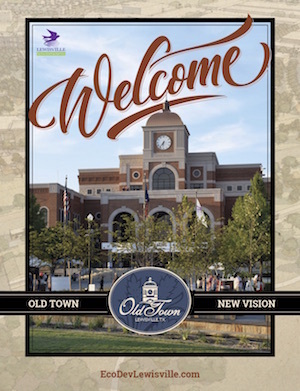 Click on any of the visuals below to learn more about completed projects, the future of Old Town, transited oriented development and all the amazing features of Old Town including our Wayne Ferguson Plaza. The Plaza is a 1.5-acre urban park built in the heart of Lewisville’s Old Town. It is adjacent to the historic Main Street commercial district and the MCL Grand Theater.